While Afghanistan is making progress in improving access to education, approximately 3.7 million children remain out of school. 2017 saw nearly half a million newly displaced people in Afghanistan, as well as an influx of over 600,000 Afghans returning from Iran and Pakistan. Droughts connected with climate change and other conflicts are pushing more people to migrate and undermining efforts to get more children in school. More than half of returnee girls and boys are currently out of school due to the lack of capacity of schools to enroll additional children, lack of required documentation to facilitate enrollment, cost factors, and language, gender and cultural barriers. Education is an essential building block in Afghanistan’s progress toward peace, security and sustainable economic development. Education brings empowerment and enlightenment. We can’t afford to lose another generation to war, conflict and displacement. The three-year programme will target the most vulnerable children in Afghanistan, with a particular focus on girls, internally displaced children, and returnee refugee communities. Education Cannot Wait and the Government of Sweden have provided the seed funding to get this programme started, and get Afghanistan’s children back in school, with US$12 million in funding from Education Cannot Wait and a generous US$10 million grant from the government of Sweden. It will be implemented and managed through a broad coalition of international organizations, national and international NGOs, and representatives from the national government and civil society. Key partners include the Afghan Ministry of Education, IOM, OCHA, OHCHR, UNAMA, UNESCO, UNFPA, UNICEF, UNOPS, UNHCR, WFP, WHO, the World Bank and Education Cannot Wait, alongside National and International NGOs such as Save The Children, Norwegian Refugee Council and International Rescue Committee. The programme builds on the progress made through Education Cannot Wait’s US$3.4 million first emergency response, which focused on access to basic education for the most vulnerable children – returnees, internally displaced children, girls, children in isolated rural areas – through community-based education, providing teaching and learning materials, and teacher training and recruitment. Up to US$35 million will be required annually from international donors and national entities to cover the full cost of the multi-year programme. We are calling on the global community to step up and be counted. Funding education in Afghanistan isn’t just the right thing to do for our global humanity, it will also power our work to end poverty and hunger by 2030, and ensure universal access to education for every girl and boy in Afghanistan. Our work to achieve the Sustainable Development Goals, especially goal 4, which calls for equitable access to education for every girl and boy on the planet by 2030, cannot be compromised. Education cannot wait for an entire generation of Afghan children that risk being left behind. What impacts are anticipated on the ground from this programme? In a country where a lack of female teachers and cultural biases have severely limited educational opportunities for girls, the investment will recruit, train and provide financial support for 14,000 teachers, over 60 per cent of whom will be women. It will also set up 2,500 gender-sensitive water and sanitation facilities, and build an awareness campaign to reach over 150,000 people. Through this joint work, the programme looks to improve numeracy, literacy and educational resilience for children by 10 per cent, increase school attendance by 30 percent to get 460,000 girls and boys back in school, and nearly triple the number of existing primary and pre-primary learning spaces from 5760 (2017) to 16,500. The investment will also provide learning materials, such as textbooks and notebooks, to 500,000 children, including 325,000 girls. Distance and danger hinder access to schools in Afghanistan, especially for girls. The investment will provide transport for 40,000 children to educational facilities, including 26,000 girls. With so many returnee and displaced children, special emphasis will be paid to helping integrate children into the education system. 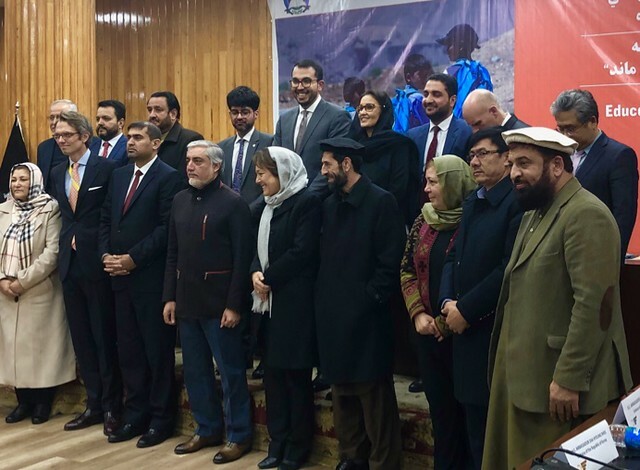 To get children back on track, over a quarter million displaced girls and boys will be supported in obtaining documentation and school certification, and catch-up classes in Dari and Pashto languages will be extended to some 276,000 children. How will this programme work to close the gender gap? In Afghanistan, education is largely delivered along gender lines, with very few mixed-gender schools. And a lack of girls-only schools and female teachers provides a significant barrier to education for the 2.2 million girls that are still left behind. That’s more than the total population of Qatar and Luxembourg combined. The Ministry of Education has just recently launched its Girls’ Education Policy specifically to remove barriers to education for all Afghan girls and women, to close the gender gap in the school enrollment of girls and boys, and to bring out-of-school girls into the education system. In alignment with this policy, the programme will focus on a wide spectrum of actions, such as: creating safe school environments, including supporting community transport for girls to travel safely to school; supporting displaced girls and boys to obtain documentation and schooling certification; implementing community-based education to reach children, especially girls, in rural and isolated areas; developing and rolling-out distance learning packages for hard-to-reach locations and communities, such as radio education programmes, self-learning materials; and providing training to 20,000 teachers, especially female teachers. What has Education Cannot Wait achieved so far in Afghanistan? This new multi-year investment will scale-up and accelerate Education Cannot Wait’s initial US$3.4 million 12-month investment in Afghanistan announced in June 2017. This rapid response programme aimed to provide immediate relief to children in need of educational support. It focused on access to basic education for the most vulnerable children – Afghan returnees, internally displaced children, host community children, girls, children in rural and isolated areas – through community-based education, providing teaching and learning materials, and teacher training and recruitment. The programme successfully reached 35,000 children, including 59 per cent girls, providing them with access to formal and non-formal education, including community-based education. Through this programme, Education Cannot Wait partnered with a local NGO, Wadan, to reach children in the most head to reach areas. For example, through this local partner, we were able to recruit and train a female biology teacher in a community of displaced people in Radat. With a new biology teacher, some 40 girls have returned to class. We were also able to provide hope and a sense of normalcy to children who fled violence in the Nangarhar’s Achin District. We provided these uprooted children with sense of normalcy and restored hope thanks to the community school we set up in displaced people settlements. Education Cannot Wait is determined to mainstream and accelerate these successes to reach more of Afghanistan’s vulnerable girls and boys and support the government in providing long-term solution to integrate them into the education system.